Let go of the intricate work on your palms and fingers and opt for a subtle design with lots of breathing space. This new bridal mehendi design is sure to look stunning on your wedding day. How about an intricate half moon design like the one above? Not only is it a simple mehendi design for brides but also looks extremely pretty and stylish. For a more bridal look, opt for delicate work on the fingers too. Absolutely in love with this feet bridal mehendi design! When you don’t want elaborate bridal mehendi designs ornating your feet, it’s best to stick to a pretty motif. A beautiful lotus pattern looks so unique and elegant. 4. It’s all about the fingers! Less is more, this simple mehendi design for brides is an emanation of this. We love the intricate art on the fingers and those delicate mehendi strings. A striking nail polish and you’re all set to rock this new bridal mehendi design. 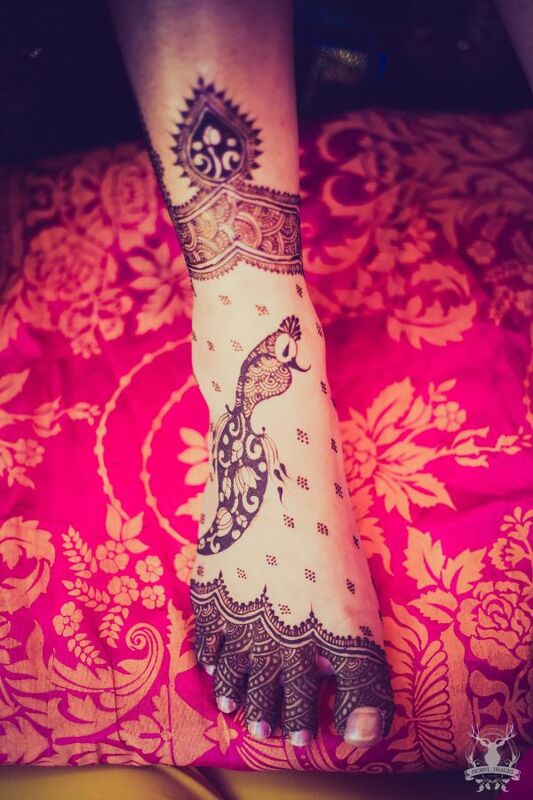 One of the prettiest bridal mehendi designs we have come across. It’s not just unique but also done very well. Love how the artist designed a beautiful haathphool to complete the look in this gorgeous and simple mehendi design for brides. How beautiful is this?! Not too heavy but still every bit bridal. The peacock motif takes center stage in this new bridal mehendi design with intricate henna on the toes and an anklet design to complete this elegant bridal mehendi design. Like to do it a bit differently? In this new bridal mehendi design, the artist has opted for different designs for both the hands. While one features a pretty jaali pattern, the other hand is all about a floral string with a lot of breathing space. Going heavy on one and minimal on the other hand is a great way to balance it out! 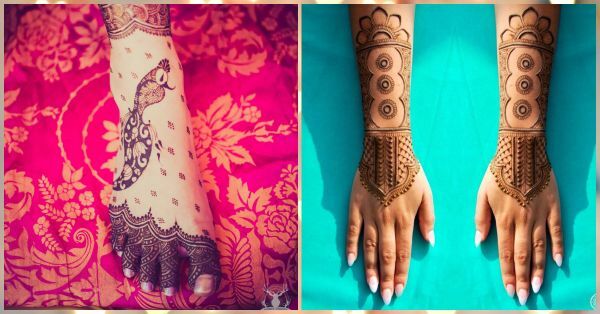 Want your feet mehendi to run all the way up without looking too OTT? A intricate yet simple foot mehendi design for brides with a floral string is just what you should opt for. You can make it as thick or as sleek to suit your style . 9. We like it quirky! Bridal mehendi designs do not always have to be traditional. We’re loving this adorable moon motif and the subtle but beautiful work on the wrist and the fingers. Don’t you love this new bridal mehendi design too? 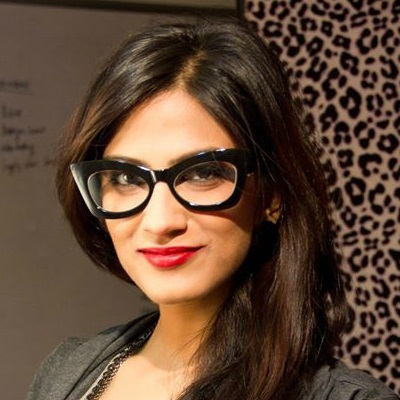 A jaali pattern always looks extremely pretty without really making your mehendi look too out-there and heavy. Take a note from this bride and sport this elegant and simple mehendi design for brides. Wear a pretty payal to complete your look.